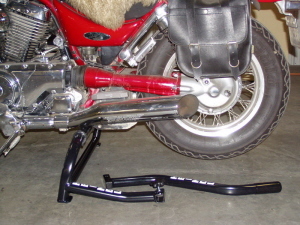 The Cruiser Center Stand is designed to fit cruisers that have a double-cradle tube frame. All you need is a flat area on the bottom of your frame. 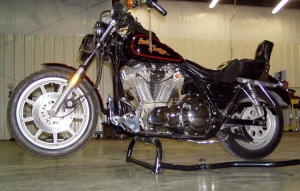 This includes all Harley, many Suzuki, Yamaha, Honda, and Kawasaki Cruisers. When the stand is raised, it is 9 ¼” tall, which lifts the front or rear wheel approximately 4" off the ground.